I just created this worksheet in Excel, so if anyone wants it, email me or post a comment with your email address and I'll email you the worksheet. I basically took a piece of paper and just quick and dirty did this. In reality, I would not be entering the data onto the worksheet into the computer unless I had extra time, but this was just to show you what I was doing. The point of this is to get into the momentum of properly setting my stops and for good entries. This is a fairly easy way way to do backtesting but to see how well you do at the same time for directional trading such as the type I'm doing. Notice I did not allow room for what option to be used here. It does matter, but that typically isn't my issue. Maybe I'll address that in some later post. I've found that though I am good with setting stops, when I'm not practicing enough, it doesn't reinforce good risk management. Yes, sorry to disappoint you, but that does happen. As I review where I go wrong in my trades, it's inappropriately setting my stops. As a super busy person, I have to find a method to consistently set my stops without reserve. It's apparent that IF I always set my stops, being profitable still prevails. I've found the most success in my trading when my funded trading mimics my practice. In the case of this example of FCX, about 2/3rds of the trades are profitable. Though 1/3 of the trades are costing, the typical costing trade is far less in value than that of the profitable trade, which is desirable. If I can scan in one of my completed Bracket Trading sheets filled out, I will, but that's a bit more of a pain to do that. No promises. The chart of FCX that I used is also at the beginning of this post. It's quick and dirty and I use the "Instant Replay" in Extreme Charts to do this. Later it gets wiped out. Trading is truly a mental game. It used to take me many hours to do backtesting of a stock and I found when I do not continually do my practice trading, my funded trading suffers. One has to pay particular attention especially during stressful or tumultuous times to be sure to continually practice. Now, how I define practice is to make it as real life as possible. The only difference between practice and funded trading is the funds. The entries, exits, position size, option, everything should be the same. 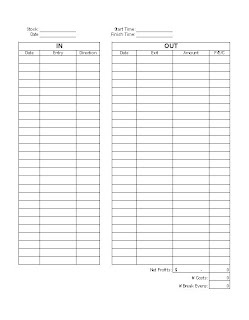 In my practice trading, the Bracket Trading sheets I use I still use. I had narrowed down the time to about 1 hr for 1 side of the bracket sheet which consisted of 5-6 weeks worth of data. But, still an hr was too long for 5-6 weeks and often due to my very busy erratic schedule, it was a challenge to put in the time. So, with some big costs in the market, I knew that I had to take a step back and figure out a better way for me to get my practice sessions in EVERY day. I found that usually the first month's worth of trading wasn't all that great for any stock I traded, but by the 2nd month, it was much better. So, for me, a minimum of about 2.5+ months is needed to get into the momentum of things. We'll see if this method of practice works. 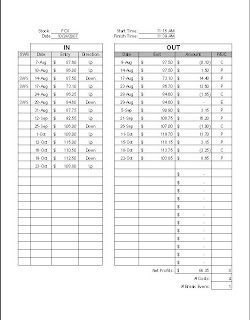 - Document at least the brackets & stops on the chart. You can document the other stuff, too, if you have time, but this take a bit of time to do. With the Full Documentation, you start off UNFUNDED, then move to small, funded positions, then fully funded. Do NOT skip steps. Well, I made a decision over the weekend after some really not good things happening in my life. It's not a decision I really wanted to make, but it's necessary. So, what I'm doing this week is now taking action and addressing that decision. Most likely, I will not have a lot of time to blog, or do a whole lot here. I know this seems all like excuses to some of those reading and I haven't spelled out all my challenges, but since this blog is very public and the stuff I'm going through is fairly private, just want to keep it that way. Remember to manage your risk, and that goes for me, too, especially during such tumultuous times not only in my life, but also in trading. Just going to take this one day at a time. So, please be patient over the next couple more months, at least. Just a quick analysis I did of this stock today. I was sharing with a fellow trader of why I like to trade the higher priced stocks, which I will relay here about our discussion. A Nov40P on this, the cost on 10 contracts pre-commission would've been $5200. On another stock, FCX, that's trading around $117, which is 2.7x the cost of ONXX, some might say, they don't want to trade higher priced stocks. Here's why I disagree. To use the same $5200, the cost for slightly OTM Nov115C, they were going for about $6.40, meaning I would have 8 contracts. Both these I would've gotten in yesterday. Todays' move was typical for both stocks. The ONXX option moved $0.30 in the option price with about a $1 range in the stock's price. FCX moved $2.50 on the option price with about $6 stock price move range. On 10 contracts of ONXX, that's $300 profit in one day. That's 6% ROI. Still very good for one day. On 8 contracts of FCX, that's $2000 profit in one day. That's 38% ROI. That's fantastic. Hmmmm....using the same money, where the ONXX was ITM and the FCX was slightly OTM....hmmmm.....and buying fewer contracts on FCX. MA: I was thinking about an entry above $166.50 because that is above the rectangle that it's been trading in. However, looking at the parabolic sars that I marked yesterday, it seems I would've already been in this trade. MA looks like a Mat Hold, which is a more bullish version of the Rising 3 Method. RIMM: Today it's not really done a whole lot. Sold off at the start of the market and really just has lingered in a sideways, rectangular pattern. At the open of both yesterday and today, looked like people were taking profits. Yesterday it did look more like profit taking. Today, more profit taking, but more of a compression pattern, to me. Momentum is still very good and the indicators still show bullish. VMW: Nice chart. I'd like to see it come back down to 89-90 range and head up to the 112 area. That would be a very nice move. AMZN: This looks like it's heading into bearish divergence and trading in a fairly small trend trading range. FCX: It looks like the $112 is a resistance level for this and is trading into an ascending wedge. So, I set brackets for the breakout. If you're in a bullish position, I'd probably set my stop just below the wedge trend line, but frankly, if it hits the $112 area, I'd actually tighten my stop and get out, then I'd rebracket and get back in again. That's just me, though. GME: You can see the chart as to how to play this. It's in a good upward trend and the targets are on the chart. MA: It's up against a trend resistance for a few days now. This is a good opportunity to bracket this line and to let the stock tell you what direction to take. If I were in for a bullish position, I'd be careful. The stop is on my chart. It's in indecision as well as compression (some). CMI: Here is something that happened to a funded trade of mine that I will share to see if any other traders can relate to this, which I'm sure many can. In practice, it's fairly easy to set protective stops, as well as stops to take profits. No real money is on the line and I zip through weeks and months of trading in a relatively short period of time. So, this also helps one to not be emotional as the markets are not dynamic at the time of when you're doing your practice trading or backtesting. The 140 mark is an all time high for CMI. Keep in mind that my opinion doesn't matter and I have no impact on the market whatsoever. Hope = Dope in trading. What does the chart tell you? Friday reaches up to tag the 140 point and since I was not home or had any computer access, this was a broker assisted trade. I told my broker when it got above 139.50, begin trailing my stop. However, since I wasn't sure if it would break 140 and continue up, I only had him do this with a portion of my trade. This is the "What If it continues in my favor?" scenario, which has happened to me a number of times. Keeping in mind, my opinion doesn't matter. I also had him set my protective stop for the remainder of my position at around $133, just in case. At the close of Friday, we end up with a doji, where the close is about the midpoint of its trading range. That signifies to me, very indecisive. The traders do not know whether to take this stock further up or bring it down. Doji's make more of a difference when they are at major resistances and support. We are at an all time high, so this doji does make a difference. There were several ways one could look at this, but in my normal practice trading, I would've said, jam up my stop to just below the close of the doji day. If it heads back up, I'll rebracket and get in at a different price with a different option, start over. If it heads down, then I'll be glad I got out at a good price. For gaps, well, you just have to take them as they come if you cannot watch the market. What I could've done here was also scale out of the trade. I could've put part of the trade at just below the close of the doji day and held the other part of the trade back for the "what if it should go up?" scenario. The intuitive part when I looked at the position before the market open was to jam my stop up and to get taken out just like that. That was my gut feel. But, often I do not like to trade emotionally. Sometimes it is a challenge to distinguish between intuitiveness and feeling, which I'm learning to do. As CMI continues to head down, my stop at 135.75-136 is hit, while I'm sitting there watching intraday. I didn't actually have my stop set with the broker, and thought (hoped) that at a pullback on the down I would get out rather than getting down in the momentum, which means I won't get filled at as good of a price. My position is still up in the account with a profit, just not significant as at the beginning of the market or on Friday. I'm about 1 hr into the market at this time watching CMI going down against my up position. The better thing here was probably to just be taken out at the beginning and replay this at a pullback, if it should decide to go back up. I'm glad that I did execute by getting myself stopped out and taking profits off the table. I can start again, but when I get the gut reaction to get out, I should just get out and start again. Look at what the chart is telling me. Traders are indecisive. When they figure out what they are doing, then I can get in, because as a momentum trader, I want the most bang for my buck and not having to get in and out of trades unnecessarily or too often, as commissions do eat into your profits. That is a part of slippage and we all have to be concerned about that. Both my children are out for Fall Break all this week. So, some of my time trading will be even further limited on top of my other commitments. Hopefully providing 17 charts this evening gives at least some effort that I am still trading and putting in some efforts here. Anyway, happy trading and as I can, I will post. $SPX: After the $SPX remained in the rectangular compression pattern for 8 days, the umph to move up seems to be somewhat stifled. We are at the all time high ever for the $SPX, so this is a significant area. What will it do? I have no clue. I did extend the trend lines from the major trend it's been in, so you can see what the upside targets are. The the candlestick pattern is a Rising 3 Method, which in the 14 others stocks I've looked at, quite a few also had a similar pattern. Seeing where the market it, and perhaps maybe another possible decrease in the interest rates, this might spark a more bullish sentiment to allow it to push up. However, perhaps just any bad news might be justification to either pullback or reverse and that would make sense very much. We'll see. It seems often the news will find whatever it is to justify whatever is happening in the market. As a chartist, it really would make sense to not go further bullish. $COMPQ: Just wanted to look at the Nasdaq on a longer term basis. This chart's timeframe is WEEKLY and you can see if it continues up where it will go and if it reverses here, it would also make sense. $DJIA: What I wrote for the Nasdaq applies here, too. The chart is a little different, but the thought process is the same. CME: This is a Rising 3 Method. All indicators are very bullish. Bollinger Bands very much spreading. Love it. BA: See chart for trend support. It's reached overbought and has reversed. Looks like a bearish play to me, but I'd bracket it to play the downside below Friday's close, but if it decides to go bullish, I'd take a very small position @ 103.50. DO: Trading into a Descending Wedge. See chart for bracket. Looks bearish, but I'll let the stock tell me what it wants to do. BIDU: This looked like a Rising 3 or Mat Hold was forming, but the doji sort of confused me here. It's gained $100 in the past 3 weeks of trading and I see the $400 range as the next target, which is around $70 away. Maybe it's just taking a rest before going the rest of the way. GOOG: This also looks like a Rising 3, but it's indicators show overbought and could stand a pullback. $600 is the number it needs to break for me to enter bullish. It would have to break below $580 for me to enter bearish. In between $580-600, I'd pretty much stay out of it as I don't want to get whipsawed. MA: Everything looks bullish to me, but it may decide to have a pullback. I see $173-174 as the upside target. RIG: It's at a pivot point and it's also in a rectangular compression pattern. See chart for upside and downside entries. MORN: This was just a stock I saw someone mention in a group I was in and just decided to take a look at it. It gets into these long compression patterns that make it uninteresting to me, however, if you want to wait that long, it could be worth it for you. QQQQ: For those who like to trade the Qs, here is my chart updated with additional targets (possible pivot points). Note it's been in a very solid trend. RIMM: Yes, I did do a strangle on it. Though the stock moved around $13, it was just break even for me in my Oct120C. I still have 2 weeks before expiration, and if it continues to move up, I may make some money on it. One of the things I don't like about strangles is the side you need to overcome, which is why I rarely do them. I do love RIMM, though, and if this was pre-split, it would've been a $36-39 move, which is almost as good as last earnings. So, there is still some time and neither of my calls or puts cost too much to put on this strangle. AAPL: This just did another breakout. The indicators look good for this to continue bullish, so if I were to enter tomorrow, I'd enter above the close of Friday or on a pullback going back through the close of Friday. It is looking to be overbought, but who knows, it can just keep going, so I'd play this to the upside until the stock tells me otherwise. 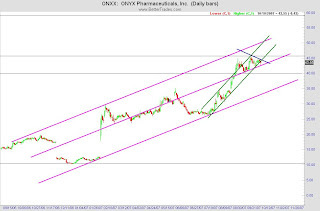 CHL: Someone in another group asked me to look at this stock and I thought since I did the chart on this, why not just put it here in my blog? Though the traders of this stock are very disciplined, the candles of this stock do no visually appeal to me as something I would be too interested in trading, but, the volumes and price ranges do look appealing. This stock is losing momentum and is also in overbought territories. CMI: I like trading CMI. Will it continue? I don't know, but my stop is as on the chart. It seems Friday was an indecisive day, though the market was doing well. FRPT: This stock, because of its price range, does not appeal to me, but maybe it would to someone reading this blog. This stock was also one that someone else was interested in another group I'm in and since I did the chart analysis on it, thought I just might post it here, too. Also bracketed it for potential entries to the upside and downside. 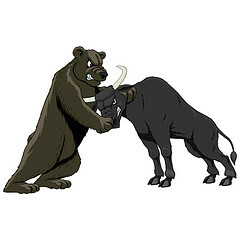 This weekend I'm going over some things I have on Iron Condors (IC), Bull Put Spreads (BUPS) and Bear Call Spreads (BCS). It will take most of the weekend to go through this and not sure if I can go through everything, but this will give me better guidelines on how to more effectively trade these. As mentioned in my last entry, I would like to get some candidates of compression patterns and set up brackets to get these ready for breakouts. The weather is really gorgeous here and my kids and I have been spending a lot more time outdoors, as I also have many things going on. Hopefully after taxes are all caught up, things will be better, but then, by that time, it will probably be the holiday season and more things to do. Patience in trading and it's important to not force trading. That's it for now. Back to my learning. One of the good things about my style of trading is that you can make your decisions after the markets are closed and either call it in to your broker or electronically manage your risk yourself. I know it seems like excuses and perhaps some of the other traders who are able to maintain good blogs seem to be able to trade and do trading stuff all the time, but as for me, that isn't the case. We are given one life and to make the most of it. Sure, I do love sitting in front of the computer and doing my trading work, sharing it with others. However, as a mommy of young children, I want to spend as much time as I can with them, while still earning a good living. If I were to really devote the time needed, I could probably make significantly more than what I am, but I am making enough to support my family and living. What good is a lot of money if you have a sucky quality of life. How I define part of my quality of life is health, relationships, fitness, and standard of living. There must be a balance of all those things. Perhaps the other blogs don't look at any of those, just trading. BUT, that is a very real part of my life and it DOES impact my trading. I've been calling in my stops and positions I want to take to my broker on the days I'm unable to be at the computer. So far, it's been 3 of the past 4 trading days. Today I got to meet an icon of mine in the business world - Loral Langemeier. It was a thrill to hear her speak and to get to speak 1:1 with her for a short period of time. She is an amazing business person and her style of business resonates very well with me. This was one of the things my husband knew that I loved doing - listening and learning from people like her. He saw an opportunity and though things aren't well between he and me, he gave me this opportunity to hear her speak and meet her. What a blessing that was for me, and how grateful I am for his thoughtfulness here. Saturday I should have some time and look for some stocks who are in compression patterns and I'll set some of these trades up and then we will just wait for the break outs. I'll also look for earnings candidates and perhaps put some potential earnings plays out there. No promises as things are constantly dynamic in my household and we have to roll with the punches. You do not need boatloads of stocks to make decent money. A handful of good moving stocks with which you understand and know the trading patterns and can execute properly, can afford you a decent lifestyle without being super stressed. Sure, if you want to make multi-millions, that will be a bit different in work than say making $100K, $50K or $250K. It's up to you what you want to make. The market has the money, so let's go get it!! How many people are into these? I took a very small position on RIMM as earnings are coming up on Thursday. I did $20 OTM and wanted to see how this would turn out. I practice traded this for 4 quarters before actually implementing with real money, and taking a very small position, just in case it does not go well. I did the Oct120C and Oct80P. We'll see how this goes. There is still some time and the options were not overpriced. Expiration is in 2.5 weeks. What I've found is because RIMM is not right near expirations with their earnings, if you buy the day before, they are often pumped up. It's often best to buy 3+ days prior to earnings before they start inflating the options. Most of the earnings in the past 3-4 yrs, there typically is a $20 move in either direction of earnings announcement. And, usually the few days before earnings, the stock does not really move a lot, often staying around the same closing. As I looked at the stock yesterday, $100 seemed like a good round number. As I was out and about and no access to my charts, had to remember what RIMM looked like and make a decision, as I did not want to buy on Tues, rather on Monday. Though the low on Friday was near $96 and the $95 would be ATM and +/-$20 would be $115/$75, that somehow didn't seem to be the right strike or looked quite right on the graph. While at the zoo with my son, $100 seemed intuitively to be more what the graph should look like, as the few days before earnings would look like it didn't move much for the closing price. Of course, RIMM's traders don't really care what I think and will do whatever it wants to do. I could be very wrong, so hence the very small position. $100 just seemed good to me based off of the research and analysis I did the past 3-4 times for earnings. If RIMM continues in the same pattern as before, I should be okay. If it turns out right, I get to make money, if not, then the cost is not too big.